This ad appears in the upcoming issue of The Prospector. The advertisement pictured to the left touts the Mt. Sneffels Press book, Railroading in the San Juan Triangle to readers of The Prospector, the quarterly magazine of the Rio Grande Modeling and Historical Society. You can get your own copy straight from us via this link. 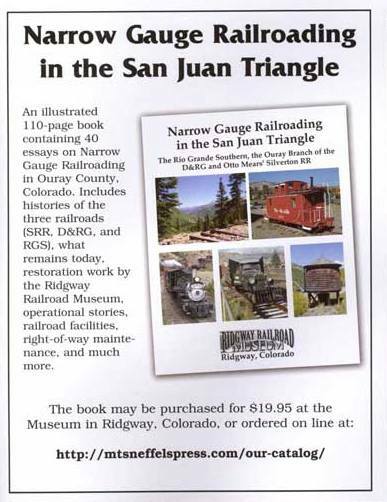 The book was developed by members of the Ridgway Railroad Museum, located here in Ridgway, Colorado. The authors are profiled here. This entry was posted in Mt. Sneffels Press, Railroad and tagged Prospector, Railroading in the San Juan Triangle, Ridgway Railroad Museum, Rio Grande Modeling and Historical Society. Bookmark the permalink.